Ok so I am stumped on this photo. It appears the 3rd baseman has a Red Wings jersey on. I searched as hard as I could and all late 40's early 50's red wing uniforms seem to have a line underneath the name. I then looked at #3 as the catcher, and the only #3 from 49-50's was Derry who was a Outfielder. The runner going down the 1st base line looks like he could be wearing a Cardinals uniform, so maybe a spring training game? Definitely 2 different teams as one teams sock has 3 stripes (Cardinals) and the other has 2 bigger stripes higher up. Anyone wanna take a stab at this? The photo is blank on the back. Can you post close/higher res scans of the 3B and runner? Know several people who know Red Wings history. so the 3rd-baseman's jersey looks more like it says "Sun Kings" and the catcher's number looks more like a 9. Rochester have used that nickname since 1928. Last edited by Butch7999; 11-03-2017 at 01:21 PM. How do I post a bigger photo? The photo I have is big but wont upload through the site. I would make as big a scan as I could, and then I would crop the third baseman real tight so I could move the image around easily. He's your best bet for an ID since we might get a good look at his face and his jersey. It's probably worth doing the same to the batter. 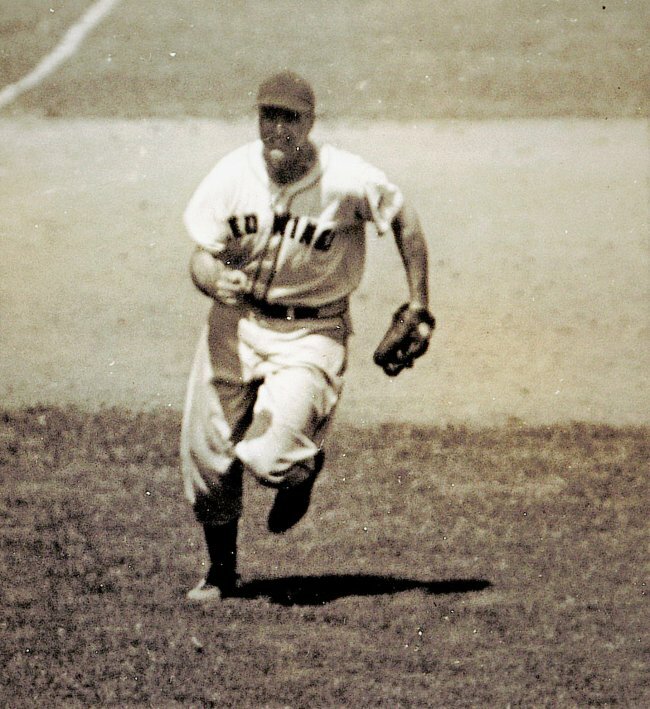 For what's it's worth, I have a circa 1940 photo of Whitey Kurowski playing third base for the Red Wings. He played there from '39 to '41. I also have a variety of photos of Red Wings from 1940 to 1963, so uniform details could help us narrow the time period. The runner looks like Stan Musial. For real. didn't take place at Red Wing Stadium -- wasn't it oriented in the opposite direction from what the photo suggests? Last edited by Butch7999; 11-04-2017 at 01:12 AM. Here are Red Schoendienst and Del Rice in their 1943 Red Wings home jerseys. They look similar to the one the third baseman is wearing. Hell yes!! Sorry I haven't posted better scans I've been out all day. Soon I will do it. Was this the only year they had this jersey? Last edited by EYECOLLECTVINTAGE; 11-06-2017 at 09:34 AM. According to the article posted by Don, the Red Wings uniform in the photo dates from 1937 to 1945. I looked at a photo of Whitey Kurowski, and it seems like he could be a possibility. I looked at another Red Wings third baseman from the same era, Gene Lillard, but the image above doesn't look anything like him. The more I look the more that batter looks like Stan the man? Any thoughts? The lettering across the front of the jersey doesn't match dual birds Cardinals uniform at the time, does it? the less it looks like Musial. haven't looked for a Springfield uni, but there is what appears to be "CAR" on the runner's jersey. If it's not Musial, it's wide open as to what year and what team that is. It would appear that the value of this exercise is probably tied to the potential value of the image if it in fact contains a very young minor league Stan Musial. Musial can be excluded from being the catcher (not a position he played) and the third baseman (Musial batted and fielded as a lefthander). This leaves only the batter/runner. 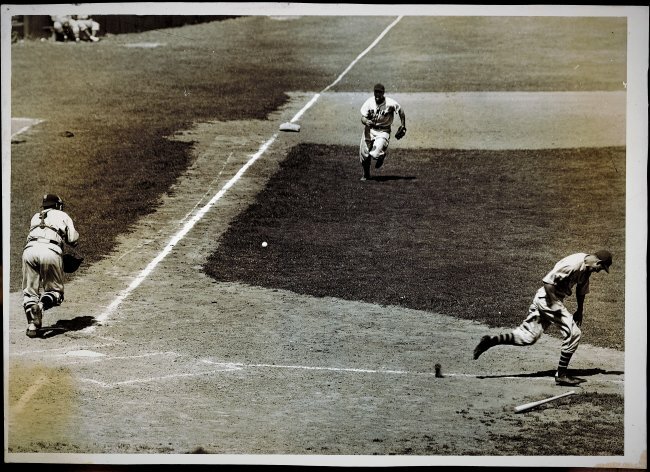 If Musial appeared in a game against the Red Wings as a minor league player, it would have to have occurred between 1938 and 1941. In 1938, Musial played for the Williamson Colts. Neither the word “Williamson” or “Colts” appears consistent with the outline or pattern of the lettering on the batters/runners jersey. Same would hold true for 1939, and then if 1939, you might expect the Red Wings player to be wearing the Baseball Centennial patch on his jersey (their team photo indicates they wore this patch). For 1940 Musial played for the Daytona Beach Islanders. Once again, the outline or pattern of the lettering on the batters/runners jersey does not appear consistent with portraying either Daytona, Daytona Beach, or Islanders. For 1941, Musial spent minor league time with the Red Wings and the Springfield Cardinals. 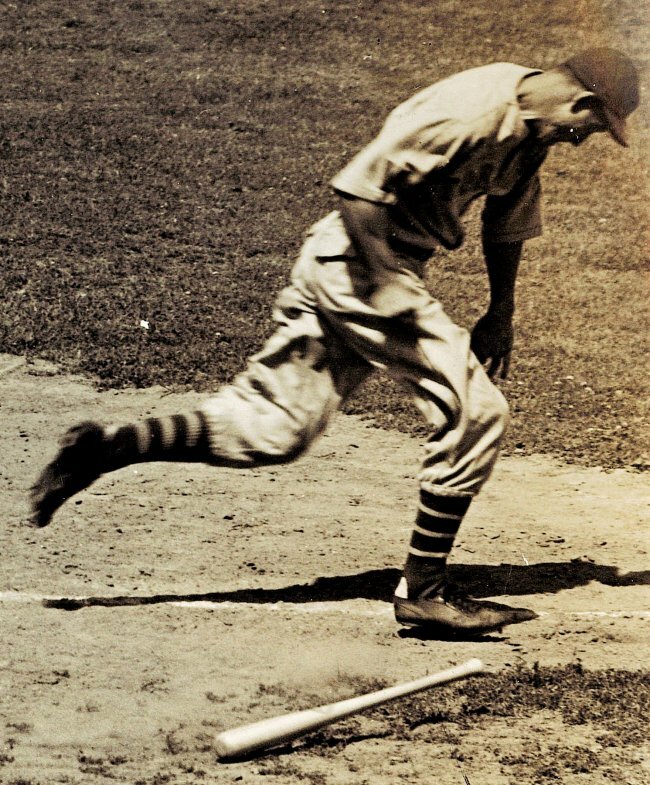 The batter/runner does not appear to be wearing a Red Wings jersey (intra-team game) and the 1941 Springfield Cardinals wore the Birds on the Bat logo just like the parent club. Neither of these would be consistent with the outline or pattern of the lettering on the batters/runners jersey. For me, these things tend to exclude the batter/runner from being Stan Musial. Maybe Toronto Maple Leafs ?? Played around with the runner image and maybe he is a member of the Toronto Maple Leafs. Attached is an image from the late 30s early 40s of Tony Lazzeri. The socks seem to match Toronto, and the stripe on the sleeve. Holy smokes that is great work!